= Kare no koto wasureyou to sureba suruhodo, omoidashichau. = The more I try to forget about him, the more I remember him…. It is going to be a long lesson. 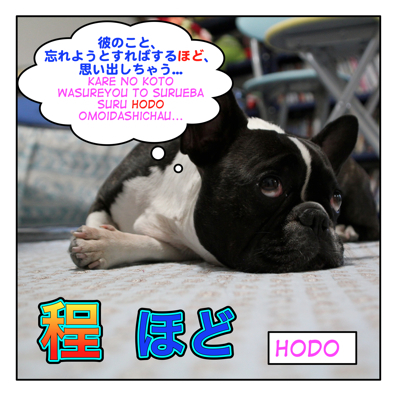 But hope you all learn more than just a word, ほど(=hodo). Ready? When you compare A and B. It is always used in a negative sentence. = A wa B hodo ~ nai. = A wa B hodo se ga takaku nai. = A wa B hodo kawaiku nai. = A is not as quiet as B. = Nagoya wa Toukyou hodo gomigomi shite inai. = Nagoya is not as crowded as in Tokyo. = Uchi no gakkou wa asokono gakkou hodo ookiku (wa) nai. = Our school is not as big as that school. = Kyou wa kinou hodo samuku (wa) nai. = It’s not as cold as yesterday today. = Ano sensei wa Maggie Sensei hodo kibishiku nai. = That teacher is not as strict as Maggie Sensei. = A wa B hodo benkyou shinai. = A doesn’t study as much as B. = A wa B hodo shigoto wo shinai. = A wa B hodo nomanai. = A doesn’t drink as much as B. = Kyou wa nichiyoubi hodo hito ga inai. = There aren’t as many people as on Sundays. = Mou mukashi hodo muri wa( or wo) shinaku natta. = I don’t work too much as before. / I don’t do crazy things like I used to. = A wa B hodo ryouri ga umaku nai. = A doesn’t cook as well as B does. = A wa B hodo karaoke ga heta dewa nai. = A doesn’t sing along Karaoke as bad as B does. = Uchi no kodomo wa tonari no kodomo hodo gyougi ga yokunai. = Our child doesn’t behave as well as the children next door. We sometimes omit the subject and object when we respond to someone’s quote. = Maggie sensei hodo dewa arimasen. = (I am) Not as cute as you, Maggie Sensei. = You’ve been gaining weight. = Maggie Sensei hodo dewa naikedone. = But I’m not as fat as you are, Maggie Sensei. Not as ~ as someone has imagined / thought / expected,etc. = Shiken wa omotta hodo muzukashiku nakatta. = The exam was not as difficult as I had imagined. = Ano eiga wa kitai shiteita hodo omoshiroku nakatta. = The movie was not as good as I had expected. = Boku wa Shizuka chan ga omotte iru hodo motenai kara shinpai shinai de. = I am not as popular among girls as you think so don’t worry, Shizuka. = Sono mise wa hyouban hodo warui mise dewa arimasen deshita. = The restaurant was not as bad as its reviews. = Kare wa minna ga kangaete iru hodo warui yatsu ja nai. = He is not as bad a guy as everybody thinks. = Kare no kega wa shinpai suru hodo ja nai. = It’s not worth while worrying about his injury. = Sonnani okoru hodo no koto janai . = It is not worth getting so mad. We sometimes describe things in an extreme way. = Kotoba ni dekinai hodo utsukushii keshikida. = The landscape is too beautiful for words. = Kono manga wa akiru hodo yonda. = I read this comic book until I got tired of it. = Kare no koto ga shinuhodo suki desu. = I love him so much I would die for him. / I love him to death. = Kinou wa koe ga kareru hodo utatta. = We sang until we went hoarse. = Kono senzai wa omoshiroi hodo yogore ga toreru. = This detergent gets rid of the stains so easily. = Kono CD wo kiku to fushigina hodo yoku nemureru. = I can sleep very well when I play this CD. = Kanojo wa puro to machigaerareru hodo no ryouri no ude ga aru. = She is such a good chef that people mistake her for a professional. = Me wa kuchi hodo ni mono wo ii. = Eyes are as eloquent as the tongue. = Nanoru hodo no mono de wa gozaran. = Sessha touzen no koto wo shitadake de gozaru. =I just did what I should have done. = Kanojo no mae de mukashi no nikkuneimu de yobareru hodo hazukashii koto wa nai. = There is nothing more embarrassing than someone referring to me by the old nickname in front of my girlfriend. = Meni mienaihodo chiisai daiya no yubiwa wo katta. = Chichi wa ryoute ni kakaekirenai hodo no omiyage wo motte kaette kita. = My father came back home with lots of gifts. = Anoko wa mada juuissai nanoni odoroku hodo no sainou wo motte iru. = Although the child is only 11 years old, he/she has an amazing talent. = Ano hito wa haite suteru hodo no okane wo motte iru rashii. = I heard he/she is loaded. = Kokono raamen wa taten to wa kurabemono ni naranai hodo oishii. = The ramen here is much more delicious than the ramen at other places. = Sainkai wo shitara naka ni hairikirenai hodo fan ga atsumatta. = When we had an autograph-signing session, so many fans gathered that some of them couldn’t get inside. = Suzuki san hodo no hito ga doushite anna shippai wo shitanodarou. = I wonder why a person like Mr.Suzuki would make such a mistake. = Maggie hodo no ii onna wa sousou inai. = There aren’t many nice women like Maggie. = I wonder why a (smart/great) person like him would come to this university. = Kokokara kurumade sanjuppun hodo no tokoro ni sunde imasu. = I live in a place about a 30 minute drive away from here. = Ato hyakumeitoru hodo massugu susunde kudasai. = Go straight about 100 meters more. = Gofun hodo chuubi de nite kudasai. = Please cook this about five more minutes on medium heat. = Ato gomei hodo okurete kimasu. = About five more people are coming later. OK, if you are a beginner, you can stop here. !ochame! = Maggie Sensei hodo seito no koto wo taisetsu ni omotte iru sensei wa imasen. = There is no teacher who cares about students as much as Maggie Sensei. =Kare hodo hayaku hashireru hito wa imasen. = There is nobody who can run as fast as he can. = Suisu hodo utsukushii kuni wa arimasen. = There is no country as beautiful as Switzerland. = Onigiri hodo sinpuru na tabemono wa nai. = There is no food as simple as rice balls. = Kyou hodo tsurai hi wa nakatta. =(There are no days that as bad as today) Today was the hardest day. = Kare hodo hidoi hito wa imasen. = (There is nobody as bad as he is.) He is the worst person. =Aisuru hito wo ushinau koto hodo tsurai koto wa nai. = Nothing is as hard as losing someone you love. to emphasize : “this much” “that much”,etc. Which one to use depends on the distance between you and what/whom you refer to. = Anata ga korehodo bakana hito dato wa omowanakatta. = I didn’t think you were this stupid. = Sorehodo okane ni komatte itara doushite hitokoto soudan shite kurenakattano? = If you were that desperate for money, why didn’t you ask me for an advice? = Nihongo wa ojouzu desune. = Your Japanese is great. = Sorehodo demo nai desu. = Soto wa sorehodo samukunai. = It is not that cold outside. = Arehodo kawaii noni kare ga inain datte. = I heard she doesn’t have a boyfriend despite being that cute. = Sakuya wa dorehodo nondaka kioku ni nai. = I don’t remember how much I drank last night. = Anokoro wa dorehodo gakkou ga kiraidatta koto ka. = You have no idea how much I hated going to school at that time. = Dorehodo no kanemochi demo hito no kokoro wa kaenai. = No matter how rich you are, you can’t buy people’s hearts. = Kono ninjin wo hodoyoi ookisa ni kitte kudasai. = Please cut this carrot in a right size. = Yon tai yon no goukon tte hodo yoi ninzuu dane. = A mixer (match making party ) of a group of four men and four women is just the right number. = Koko wa hodoyoi ookisa no mise da. = The size of the store (restaurant, bar) is just right. = Maggie wa risou no josei niwa hodotooi. = Maggie is far from my ideal woman. = Seikai kara hodo tooi. = Not even close to the right answer. = Kare no koto wo shireba shiru hodo wakaranaku naru. = The more I get to know him, the more I don’t understand him. = Anohito no kotowo suki ni nareba suki ni naru hodo kokoro ga itai. = The more I love him/her, the more my heart hurts. = Kono keshousui wa tsukaeba tsukau hodo hada ga shittori shimasu. = The more you use this lotion, the more moist your skin gets. = Nihongo wa benkyou sureba suruhodo oku ga fukaku naru. = The more I study Japanese, the deeper it gets. = Ninzuu ga ookereba ooi hodo tanoshii desu. = The more the merrier. = Hoteru wa yasukereba yasui hodo ii desu. = The cheaper hotel is better. = Ohenji wa hayakereba hayai hodo tasukarimasu. = The sooner you reply to me the better for me. = Zuuzuushii nimo hodo ga aru. = What a nerve. / You have some nerve. = Babakashii nimo hodo ga aru. = It’s way too stupid. = Joudan nimo hodo ga aru. =It has gone way beyond the joke. = Kawaii nimo hodo ga aru. = (Someone is) way too cute. If you hear this expression, feel free to remember me. When you control the amount of things/activities. = Hodohodo ni shite okinasai. = Osake wa hodohodo ni. = Don’t drink too much./ Drink moderately. = Korekarawa tabako mo hodohodo ni shiteokimasu. In business or formal situations, you see/hear these kind of expressions. = Gokakunin no hodo yoroshiku onegai itashimasu. = We thank you in advance for looking into (checking) this matter. = Gorikai no hodo yoroshiku onegai itashimasu. = We thank you in advance for your understanding. = Gokyouryou no hodo yoroshiku onegai itashimasu. =We thank you in advance for your cooperation. = Goaiko no hodo yoroshiku onegai itashimasu. = We thank you in advance for doing business with us. =Korede “hodo” no tsukaikata wakarimashita ka? = Do you know how to use “hodo” now? = Korehodo nagai ressun ni naru towa omoimasen deshita. = I had no idea this lesson would be this long. = Maggie Sensei no saito hodo “Hodo” ni tsuite kuwashiku setsumei shiteiru saito wa nai desu yo. = No other site explains how to use “hodo” as well as this site. how could it be translated? to be so busy that one’s head spinning. I am reading asahi, and came across this sentence. How does the last part translate? There are things I want to ask. Is it possible to shorten the following sentence? Modifying the ring. Would it be alright to drop the ‘の’? 3. If i want to say, ‘that person has countless/so many cars’ using ほど expression. 3. あの方は、数え切れないほど車がたくさんあリます。Should i add ‘の’ to modify the car ? Would you mind to take a look at the following sentence, I wonder if I make any mistakes. It is possible but it is more clear with 小さい. The original sentence itself is not natural. And thank you too 天人さん for letting マギー先生 know. I have read all the article, but I couldn’t find an answer to my question. What’s the meaning of ほど in this sentence? I really can’t figure it out! OK, the simple form is easier to understand. A is not as sweet as B.
Apples are not as sweet as strawberries. = The show business was not easy as the promises with the entertainment companies would be kept. In other word, The show business was tough. The promises with the entertainment company wouldn’t be kept. Oh my god, thank you very much for answering my question. This is in board terms the context. A guy from a model agency made a promise to a model but in the end he broke it. That sentence is from a thought of the model. OK, then it make a sense. ~ほど甘くない It is not that easy to do ~. I do not know what it means. Could you explain? I was reviewing this again, and I came across something curious. The diamond was so small it is like you cannot see it with you eyes. Why do we say 目に見えない? Shouldn’t it be 目で見えない? Because we are saying “you cannot see it BY looking”. I understand the particle で would be use for situations when you want to say “by…”. For example, “by car” – 車で. So when we want to say “too small to see by sight/eye” (目に見えない)… why do we use the particle に? 自分の目で見る　= to see something with your eyes. to be visible in one’s sight. So actually it is a location marker. a very good question, indeed. 目で見える indicates means of action (= can see / is able to see !with! one’s eyes). It stresses more the fact that something can be seen. 目に・から見える refers to a location (eyes / sight), where something becomes visible (= to be visible). It stresses more this location, rather than the action itself. 人の目に見えない = Something is beyond one’s vision / something is not visible to one’s eyes. 人の目で見えない = Something cannot be seen with one’s eyes. Thank you very much to you both. It means just right. Is this related to ちょうどいい? Both seem to mean the same thing. When should I use which? ほどよい　and ちょうどいい　both mean “just right”. They could be interchangeable in some cases but when you are talking about the size or something fits someone perfectly, you use ちょうどいい. He showed up in the right time/timing. Wow, seems like a subtle difference, but I think I understand. Thanks so much and thanks for the lessons as always. 想像していたほど and 想像していた通り Are both possible? If so, how does one tell when to use which? You imagined the building was big but it was not as big as you had imagined. →When the fact is different from what you have imagined. →When the fact is the same as you have imagined. What is the significance of hodo here? Like, is it saying the ‘the amount i reached out, was the amount i kept waiting’? I am really confused….Thank you in advance! This is a very poetic expression. Imagine, it keeps raining and you miss the blue sky a lot. This ほど describes how much you have missed the sky. As you reach out your hand towards the light which you can’t even reach. It’s minor but think I might’ve found a typo? Thank you for spotting the typo,Tina! I fixed it. My guess:I cannot stand up fast because I feel my back hurting? Let me break it down so that you can figure it out. = Suddenly I felt a pain in my back. 立っていられないほどの express what kind of pain. My back is in so much pain to the extent that it seems like I cannot even stand still? So it is raining a little but it is not as hard as you would need to use an umbrella. First of all thank you for your great lesson ! But actually I have a question, it’s about a sentence that I’ve heard in a song. So I wanted to know what it really means ? I just wrote to someone yesterday but I don’t do the translation here (especially lyrics.) but just this once. So the rumor/gossip spreads to the extent that you can’t prove if they are true or not. If it helps, there’s a battle going on and the person saying this has been ignored this whole time, until she brings out a huge weapon and says this line to the enemy. Thought it might be something like that but wasn’t quite sure, thanks for the reply! 噛めば噛むほどうまい. So the first part (噛めば） is missing. The more you chew, the more tasty it gets. Haha, 今回はまだ起きていましたよ！　Thank you for helping, Chii, anyway. Hi Maggie-Sensei, I’ve gone through your lesson, but I’m still not sure what hodo means in the following sentence in my book. People who drink coffee a lot do not get freckles easily? What role does hodo play here? ほど used in this sentence implies “the more… the…”. So according some scientific studies a negative correlation was found between drinking coffee and getting freckles (= the more coffee you drink, the less you are prone to getting freckles [lit. the harder freckles you can get]). It seems like you have a nice friend who already helped you here. Thank you 天人 for helping Yan. Now I go get a cup of coffee!! ≡≡≡ﾍ(* ﾟ-)ﾉ.
Oh, now I get it. Many many thanks! Hello Maggie-sensei! Thank you so much for your lessons! Or maybe ほど here refers to the extent of “crumbling” and “breaking”? It is hard to translate poetry from a few lines but I think the subject of the first line is the person who the speaker want to look at. How would you translate 悲しいほどに美しい then? Would it be “A beautiful as (she was) sad”? So beautiful that I (or the proper subject) feel like crying. Thank you for the lesson. I have a question about another useage of hodo. I was searching around how to say ‘I’m not good enough to..’ and found this grammar pattern that you didn’t mention. Is this correct? My Japanese is not good enough to speak to you. If that is possible, can I also say things like these using the grammar pattern above? I can’t run fast enough to catch up with you. I’ve had enough of eating sushi. I ate too much. This product’s quality is good enough for me. Q：If that is possible, can I also say things like these using the grammar pattern above? The following expressions will be…. Sensei i have a some questions. so i started reading the この素晴らしい世界に祝福を！ light novel for practice and it said in a sentence : あなたはつい先ほど、不幸にも亡くなりました. question 1. why does the author use both tsui and saki hodo? dont they have the same meaning or am i missing something? is it like an expression? question 3. this isnt really important but on the　亡 kanji there was furigana saying it is read as na, is there some reason it was added? usually kanji dont have furigana in light novels unless they are names or they want them to be read specifically. i found more words with furigana, i guess light novels do have furigana for some words after all. You often use them together. Q2, Q3, I guess you figured out the answer yourself. Maggie-Sensei, can you explain how the movie Warui Natsu Hodo Yoku Nemuru uses hodo? Your post seems exhaustive, and maybe it’s my yoku-nai nihongo, but I don’t see a use that fits it. Arigatoo! I should have covered the usage. When speaker express their opinion how things works or gives some stereotyped phenomenon/person. = Warui yatsu hodo yoku nemuru. Apologies for all the above as I’m sure it’s not half as comprehensible as it was in my head. *I hope it is correct. I always look for patterns on the structure to make my studies easy, but I’m cracking my head trying to figure that one. You don’t actually die but to express how much you love him in an exaggerate way you use 程. 言葉にできないほど= You may able to express the beauty of the scenery. 飽きるほど= If you get really tired of reading something, you wouldn’t keep reading but you do. So you bring up some extreme/exaggerate example to show the degree of things. Your lesson about hodo is very useful. Thank you very much. However, I found a sentence like this and can’t tell what type of this “hodo” in the sentence. Hi, sorry for the late reply. I was on the short winter vacation. You posted the same questions a couple of time and 天人さん was trying to help you. Did you read his comment? Sometimes we omit the 〜ば because it looks/sounds repetitive. For some reason, my posting seemed not gone thru so I keep repeating the posting. Sorry for annoying you. Thanks for yours and 天人さん’s clarifying. I was on vacation and it took me a while to activate your question. The more a man knows, the more he discovers his ignorance. There’s a long and a short version of the ～ば…ほど construction. Long: （ゲームは）難しければ、難しいほど面白い。 ==> Used in conversations & texts; sounds more formal. Short: （ゲームは）難しいほど面白い。 ==> Usually used in conversations; sounds more casual. 人は知識が深まるほど、自分の無知に気がつくものである。The more a man knows, the more he discovers his ignorance. OK, I won’t do the translation here but I will break it down. (冷静な)現実を武器として持ち出す = to bring up (冷静な)現実 as a 武器. What do lines 1 & 3 mean, and how is ほど being applied grammatically there? They are trying to express how big their dream is. So I would like to have so many fun things, having an eraser as big as the size of he Himalaya Mountains and a pen as big as the size of missile. I came across this page while looking for an explanation of a specific construct, but saw that it wasn’t actually explained here… the use of ほど as a subject marker in lines like (x)ほど(y) to mean, to my understanding, “that which is x are/do y, unlike that which is not x”. The specific constructs in question used “(qualifier)人ほど(statement)”, as in the proverb 下手な職人ほど道具に難癖をつけたがる, which I take it differs slightly in meaning from the variant 下手な職人は道具に難癖を付ける by emphasizing that “while 下手な職人 do this, those that are not 下手な職人 do not do this”. I would greatly appreciate a proper explanation, though. But there’s no REAL difference between ほど and は in this construct? Yes, the meaning are the same. は also has a function to show the contrast. While は is just A = B, ほど emphasizes the meaning “the more~ ” more than ”は” and you see all the degrees/levels in your head. したがる・する the translation is the same but したがる involves the desire to do something more. I have a がる lesson. 1. I’ve been tought to use ほど in negative comparisons as you explained in the first section: A wa B hodo ~ nai. But I was wondering whether you could use より instead ほど in this case to, like in normal comparisons. In the “verb + ば + verb + ほど” section, why is 好きになる repeated as a whole in this case? Isn’t grammatically just なる the verb and 好きに an adverb or a noun? Is it because it’s an expression or are verbmodifiers like adverbs repeated too? 1. OK, here is the difference. (1) We tend to use より more when we compare two things. (2) ほど is talking about the degrees. You don’t usually use より in a negative sentence. 2. You have to change the pattern. If it is a compound verb, 好きに＋なる, you can skip the first part. But if it is one simple verb, you repeat it twice. I don’t know what そんなに means. Can I get a translation please? I see you like Toka-chan so much. “Hodo” is used like “the more it’s”? 1) The trivial memories come back to use more. The more you want to delete the memory, the more it comes back to you. Not really sure what this sentence is talking about. Is the sentence structure mentioned in your post? I don’t do the translation but I will help you understand the structure. OK, let’s break it down. This sentence is kind of long, so let’s break this down as well. What is to be determined? Now can you figure out the whole thing? May I have one question? Is there any difference between these two sentences? 1.I’m not as good at talking as the person I want to talk to the most. 2.I can’t even talk that well to the person I want to talk to the most. The subjects of these two sentences are different. AH! That makes sense now, thank you so much! I’ve been trying to understand songs specifically because they’re challenging, my goal is to see unusual forms of 日本語 to stretch and strengthen how I think about it. Anyway, thank you again for replying and for writing this massively informative article! You’re very welcome!! Good, keep enjoying studying Japanese in your way! When I saw hodo I was like “Oh great, that hodo word again…” and eventually found my way here, haha. Admittedly, I’m still not totally clear on the meaning; is he saying he doesn’t get where he came from as much these days (as opposed to the past)? Anyway, I feel like the whole song is probably sung with lots of slang and casual speech, so I’m not able to understand much anyway and there’s not much I can do right now to help that…But I’m glad I found my way here regardless, I learned a lot! Everybody has a different way of learning language. And I agree. You should study Japanese from what you enjoy is the best. But just remember. Studying Japanese from J-pop or anime songs are sometimes confusing because it is very different from how we talk and order of the words are sometimes different. You may have checked the word 佃煮 already but 佃煮 is a name of Japanese food but of course, 佃煮にするほど is an expression when there are so many things. There are also other expression to describe when there are too many something. Think my post didn’t come through so. I have a lesson on やすい・にくい. Check this lesson. It’s not so much about the hodo but, the tomo that I don’t get. How can we translate this?? wow. thank you so much dear maggie sensei and 天人さん. thank you much for giving examples. n_n. thank you much for creating this friendly and helpful site. good day dear maggie sensei. thank you so much for your explanations. as always, you really are brilliant. oh sorry to bother, it is just that i am wondering what if (verb+hodo+ni) will mean. but if i just over look it on the existing comments of lesson(s)please correct me and please forgive me. thank you so much in advance dear maggie sensei and everyone. Oh, now I understand ほど has a lot of different uses… I guessed that was the meaning, but I preferred ask you and get sure. I´m studying ほど and I have a question. There is a sentence I´m not sure how to translate, and what´s the use of ほど that they do. A great question! You are right 若い人ほど is from “若ければ若いほど”. Young people tend to wake up late (more than older people). The younger you are, you tend to wake up late more. This is a technique that we use to emphasize the word which comes before ほど (in this case 若い) and it often use to bring up the unexpected fact. When it gets hotter, we prefer to eat something hot more. What’s the difference between としたら , とすれば and とすると ? It works with adjectives ? Yes, it works with adjectives. But sorry, it is hard to explain the difference in this comment section. I will add it to the future lesson list. よかった！！I’m very happy to hear that!! Thank you Maggie-sensei! Please continue the good lessons! I’m also learning at a school, Learn Japanese In Singapore so this is a great additional practice! Wow, I was familiar with the basics of how to use “hodo” but this lesson showed me all sorts of different ways to use it now! Great job! please continue doing this! i think yours is hands down the best website to review conversational japanese. i tend to learn just by repeating what people say, so it’s really useful to have your site provide a written down version of this that also analyses the grammar and everything. if i can request one thing: it would be cool to have a lesson on words that you can use in business meetings. it’s always hard for me to find the right “tone”. Basically simple stuff like “hey, so we’ll start with the powerpoint now” and “ok, please look at this graph here” and stuff like that. I’m also wondering what level of speech is appropriate when taking business contacts out for drinks: Sure you don’t want to sound too formal, but also not too casual. Meanwhile, if you have a question, please feel free to leave a comment here or follow me on Twitter or Facebook. I can answer your questions. It is always safe to use 敬語(keigo) formal languages in business situation unless you are talking to your subordinates or coworkers or someone really close to you. Even if you avoid sounding too formal you should stick to desu-masu form. Haha, I have never played golf so I should learn how to play golf first. I wonder if they allow a dog to play golf though…. Thank you Maggie-sensei! That was an excellent lesson as usual. We just learned about “~(verb)ba~hodo” at university so it’s great to be able to consolidate my learning and get to know other ways to use “hodo”. Oh great! You have just learned ほど at University.